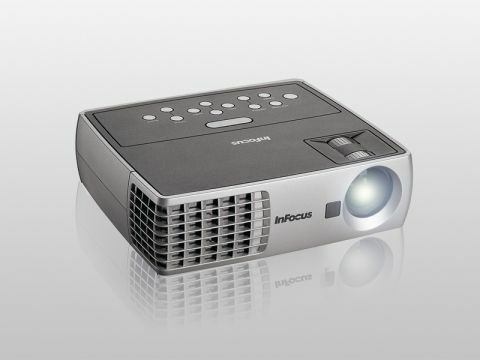 The InFocus IN1102 is a 1.3kg machine that uses DLP technology to deliver a stunning 2200 ANSI lumens brightness. Being DLP, you'll find a high contrast ratio, the levels between white and black, of 1800:1, which means you'll find sharp whites and deep blacks. The unit is small and compact, but still delivers an image size of between 0.7 and 7 metres at a maximum distance of 12 metres. An array of set-up buttons include keystone correction, source and even volume controls for the 1-Watt built-in speaker. The InFocus menu system is comprehensive, but easy to navigate. Connections on the rear of the unit are also comprehensive and comprise VGA, Composite, S-Video and audio-in ports, which are all neatly colour-coded so you can set the device up easily. There is also the addition of the latest DisplayLink port, which uses a mini-USB port to offer a quicker data transfer rate. It means the device is a lot easier to set up and run, finding our test laptop a lot quicker than simply using the VGA input. In use we found this quite a loud projector to use, as the fan works hard to keep the insides cool. Dropping the unit down into Eco mode, which reduces brightness levels to 1650 ANSI lumens, offers a noticeable reduction in noise generated. If you're projecting in smaller rooms, we'd suggest opting for Eco mode as your default setting, as it also means you'll extend the average life of the bulb. The InFocus IN1102 is a compact data projector that supports laptops up to a maximum resolution of 1680 x 1050 pixels (WSXGA+), but can also be used to handle 1080p through the DisplayLink port. While it's a loud unit to use, the portable design makes it ideal for anyone working on the move, while the powerful specification can be used in almost any setting.